Today I am happy to welcome Bethany from No Twiddle Twaddle. Bethany’s blog is devoted to two of my favorite activities: reading and play. She also puts out a list of free e-books Monday-Saturday. If you haven’t visited her blog, you should definitely check it out! My kids love homemade muffins, but always make a nasty mess out of them. My preschooler will only eat the tops off of his muffin, and my toddler loves to tear her muffin apart in little pieces. Beyond the mess, I can count on the inevitable tears if the muffin paper breaks the muffin apart. So, we love muffins, just not the after effects. 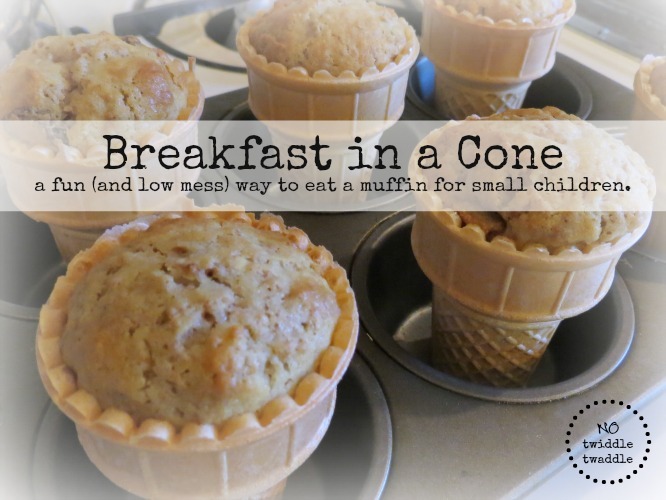 Recently, I stumbled upon a fun solution to the messy muffin problem: Breakfast in a Cone! 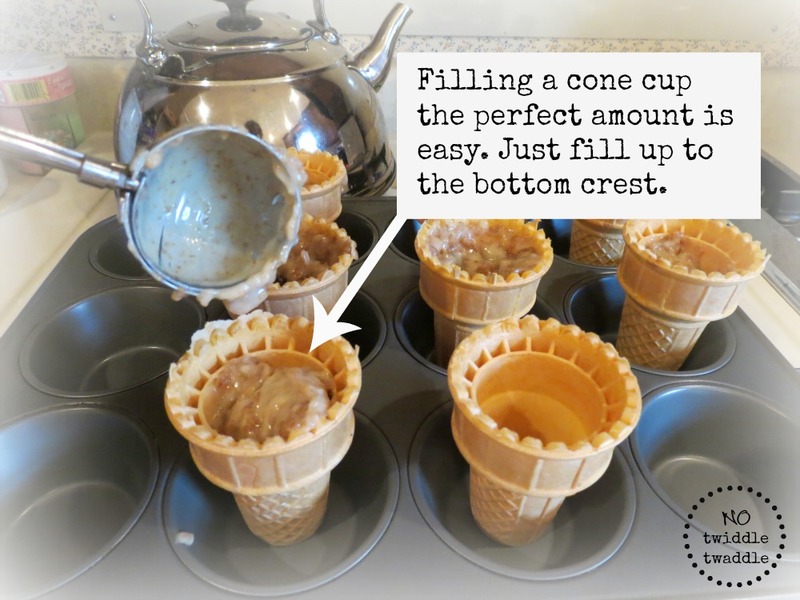 After you fill the cones, bake the muffins at the same temperature and amount of time as you would normally bake them. This recipe bakes for around 25 minutes at 350 F. And voila, you have a kid-friendly breakfast that is easy to eat on the go with no crumby wrappers to throw away! Plus, you would be amazed by how well kids eat bran muffins when they are packaged in ice-cream cones. 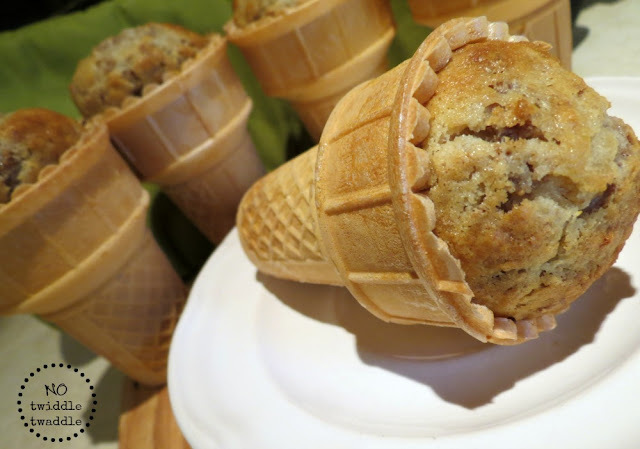 I’ve created a literature-inspired fun meal to go with these cones that I will be posting soon on No Twiddle Twaddle. Be sure to stop by and follow so that you don’t miss out! 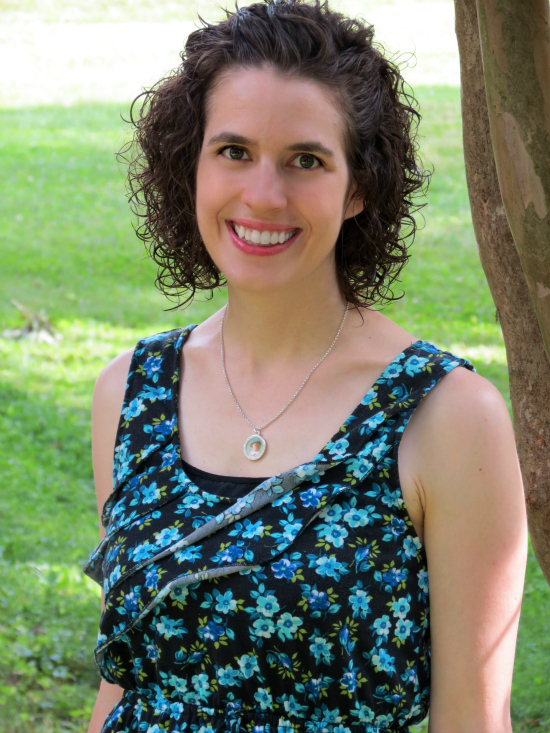 Bethany started No Twiddle Twaddle in January, 2012, to create a kid lit and play blog that combines love for great literature with a down to earth perspective of a mom with small children. When she’s not writing (or folding the never-ending stack of laundry), you might find her killing dragons in the backyard, joining a mission to Mars, or if lucky, curled up on the couch reading to her kids. Not only does Bethany write about fun activities for kids, but she also writes a daily list of the best freekids’ eBooks, reviews children’s books, and creates literary activities for parents and teachers.